The Chihuahuan Ravens (Corvus cryptoleucus) - formerly known as the American White-necked Ravens - are native to the United States and Mexico. 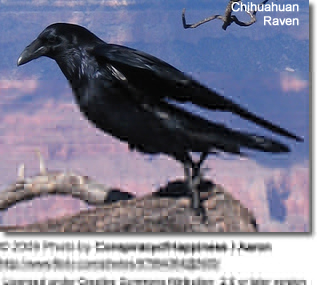 The Chihuahuan Raven is found in the Southwestern and Midwestern United States, including southeastern Arizona, southern New Mexico, southeastern Colorado, western Kansas, western Oklahoma, and southern and western Texas; as well as northern Mexico. The Chihuahuan Raven measures about 17 - 20 inches (44 - 51 cm) in length - including the tail, which is about the same size as a Carrion Crow, or slightly larger. 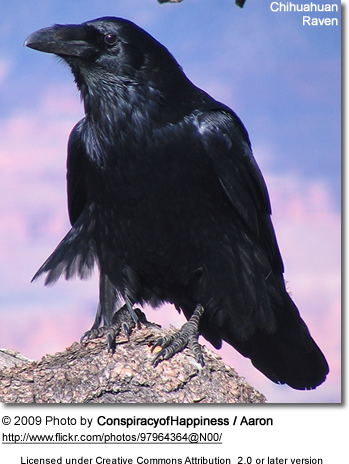 It has similar proportions of a Common Raven with a heavy bill. The black plumage has a rich purple-blue gloss that in good light conditions. The nasal bristles extend about two-thirds the length of the bill.. It has white feathers at the base of the neck feathers - but are only seen when ruffled in strong wind. The bill, legs and feet are black. Chihuahuan Ravens feed on cereal grains, cactus fruits, insects and many other invertebrates, small reptiles as well as scraps of human food. Most nesting activities occur in May. The large nests are typically built out of sticks, branches, wool, rags, roots and moss and held together with mud and dung. The nests are placed in either trees or large shrubs. On occasion, they may nest in abandoned / old buildings. Ravens prefer to build their nests away from other Ravens. The typical nest consists of 3 - 7 eggs, which are incubated by the female alone for about twenty days, during which time the male provides her food. Both parents care for the young for about six months. The Chihuahuan Raven's calls are described as "pruk-pruk" sounds - similar to those of the Common Raven, as well as croaks. In captivity, Ravens have even been taught to mimic words.